If you use Google Analytics to get some insight into how people use your webpages, be sure to check out Content > In-Page Analytics. It gives you an idea of what people click on, and that can influence your design decisions. It looks like I should spend some time improving my About page, since a lot of people go to it. 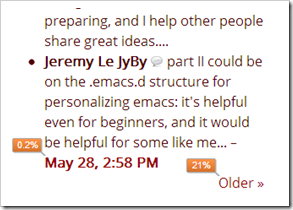 Some blogs recommend removing the Recent Comments widget from the sidebar because people don’t find it useful. I find it handy for seeing what people are talking about, though, and it seems that other people do too. (21% of clicks to see older comments!) 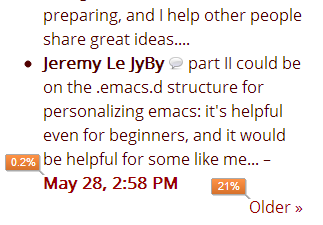 I switched to using the Better WordPress Recent Comments plugin in order to show comment previews. There’s a slight delay because I’m using the external Disqus commenting system which still needs to synchronize with WordPress, but I like it overall. Some blogs recommend manually selecting Top Posts & Pages instead of leaving it up to the computer. 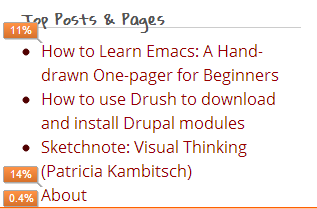 This one is automatically selected based on recent views, which is great because it comes up with recommendations I wouldn’t have remembered or thought about (like that Drupal one!). I should make a Resources page, though. I include links to blog posts in my weekly reviews. This is surprisingly useful for both personal memory-jogging and for helping other people jump to things quickly. 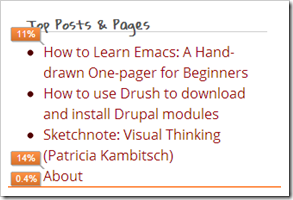 I have a hard time getting the hang of “Next page” and “Previous page” navigation on blogs. (Am I going forward or backward in time?) I changed my theme to make it easier to figure out which direction you’re going in, and I have these paging links at the beginning (near a table of contents) and at the end of the page. This is all the way near the bottom of the page. It has the same numbers as the ones up top, so I think Google Analytics might be getting confused about the links because they go to the same place. (Same with the Older Posts link.) I can probably disambiguate the links by changing the tracking code. Check out Google’s In-Page Analytics if you have it on your site! Note: Got an error while trying to use In-Page Analytics? Make sure you’re properly calling the Google Analytics code on the site. I use a Wordpress plugin to make sure that my visits aren’t tracked when I’m logged in (no sense in throwing off the stats with obsessive refreshing! ), so I needed to log out of my site before checking In-Page Analytics.